Stephen Earp works within the redware tradition, the common name for a variety of domestic, lead-glazed pottery made in New England between the 17th and 19th centuries. Originally, redware was produced to meet the daily needs of food storage, preparation, and serving such as plates, platters, and pitchers. On occasion, redware served commemorative and decorative purposes. 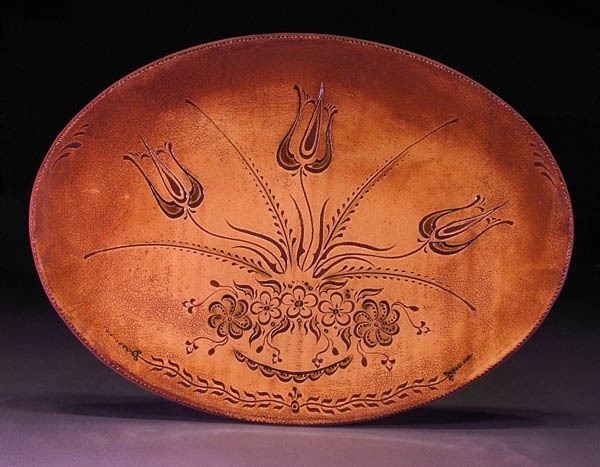 Stephen Earp' pottery uses imagery inspired by the slip-trailed designs of New England redware potters. Other sources of inspiration include the highly decorative Pennsylvania tulip ware and the slipware pottery of Devon, England, which was imported in great quantities into theolonies before the Revolutionary War. "The lives and works of the early redware potters enthralls me. I am drawn to their tenacity, quirky habits, and the history of the forms they produced. It is amazing to consider how certain forms traveled through the ages virtually unchanged, while tracking the family tree of others is like a game of telephone played out across centuries and continents." Most of Earp's pottery is thrown on a wheel that he designed and built. He uses local materials including clay from a family owned pottery in Sheffield, Massachusetts, which mines clay from a local seam. His glazes include locally dug clay, as well as ashes from the hay of a nearby farmer. In 2007, Stephen Earp was included in Early American Life Magazine Directory of Traditional Crafts. Earp was named a Traditional Arts Finalist in the MCC Artist Fellowship Program in 2008 and 2016.